The exhibition opened for entries in February and closed in March. It was very encouraging to see some members entering the exhibition for the first time this year, and of course great to see back those regular members that enter every year, and you get to recognise their work as soon as is it put in front of you. Just over 150 members entered the exhibiion, slightly up on last year. If you enjoy entering the exhibition, please encourage your fellow club members to enter in 2020. The KCPA opened the doors at Detling Village hall for the 5th open selection event, on Saturday 23rd & Sunday 24th March 2019. It was good to see the club members in the audience viewing the selection of the KCPA. If you enjoyed the event don’t forget to tell your fellow club members, so they can come along next year. Unfortunately, whilst not all federations offer their club members a chance to come along and watch the section taking place, it is slightly disappointing that each day only attracted around 30 club members. It would be great to see many more of you in 2020. Thank you all those that came along over the weekend, I hope you enjoyed seeing over 1200 pdi’s and over 900 prints being scored. My sincere thanks also go to the many helpers that came along to help over the weekend incuding, Jane Puncher, Penny Lewington, Chris Shore, Alan Lomakin, Rupert Brun Roger Parker, Steve Carroll, Clive Tanner, Carole & John Lewis, Joan and John Austin, Lorraine Grey, Chris White, and Rosalind Eastman. 2019 saw some changes in the entry for the exhibition, in that we went back to our old pricing, of £5 for a minimium of 3 images and £1 per addtional image. Our nature definition also changed to take into account changes in PAGB definition introduced in 2018. 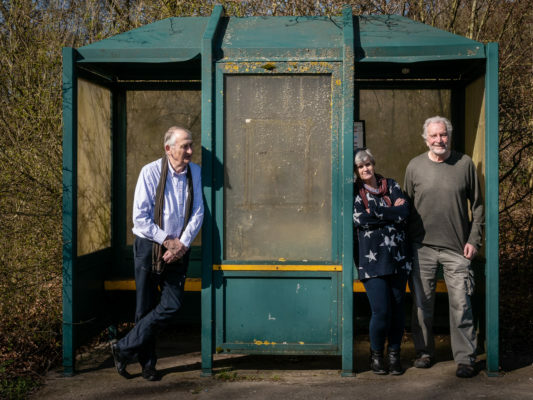 Our selectors, Gordon Jenkins APAGB, Dianne Owen FRPS, and Colin Westgate FRPS MPAGB MFIAP did an amazing job of scoring all the images via buzzers, especially over a time period of just 1.5 days. Each of our selectors scored each image from 2 to 5 (images, therefore received a score of between 6 to 15). 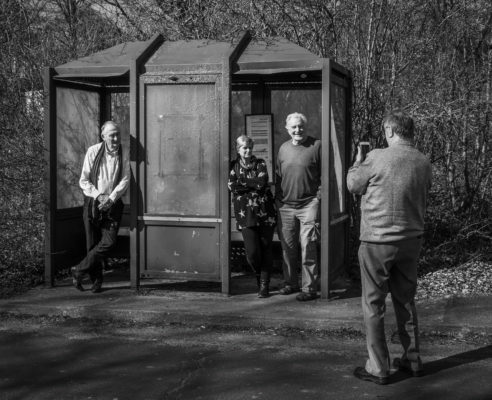 Clive Tanner with our selectors Gordon Jenkins, Dianne Owen and Colin Westgate (Image taken by Rupert Brun and titled ” Clive Tanner Shoots Judges”). Thank you to all of you that joined in the exhibition. Hopefully, I will see you at Creek Creative during the exhibition showing. The presentation evening (which is invite only), will take place at Creek Creative on Saturday 4th May 6.30 – 8.30 pm. Winners of medals, ribbons, and merit awards have been sent an invitation to attend. If you have not responded yet, please do so. I would personally like to thank the many exhibition entrants for their kind emails of thanks, it is appreciated. As exhibition coordinator I have the best role on the committee, in that I see the images first hand and like nothing better than seeing more of them coming in. Why not put a new folder on your desktop and spend the next 11 months adding your best images to it, in preparation for the KCPA Exhibition 2020. It would be great to see even many more images coming in next year. KCPA President & Competition/exhibition Coordinator.